Angels are heavenly messengers who carry signals from God to people. It’s cause God is just too big. Too mysterious. And people can’t comprehend that mystery. So that’s what angels do. Help people communicate with and understand God. We send messages. We whisper secrets. We say, “Look God, the people are lost.” And he just shrugs and says, “They will be found. I have faith in them.” Sometimes I think angels don’t understand God either… But at least we have a direct line. Kinda. 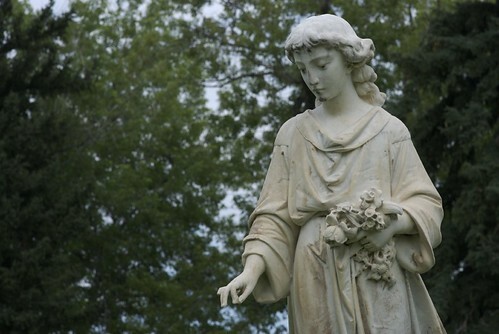 Why are there are so many angels in cemeteries? It’s in our nature. We like dark, light and shadows. So you’re going to find us in cemeteries, cathedrals, temples, places like that… Sipping coffee. Gossiping. Listening. Cemeteries are quiet and lonely, filled with lost souls. Their spirits are stronger in the place where they rest. We appear in cemeteries to make sure they have a way to get through. Sometimes they just need that extra bit of comfort. What angels are in the Bible? Lots of angels are mentioned in the Bible, but only three are named: Gabriel, Michael and Raphael. All three are archangels. Raphael is in the Old Testament Book of Tobit, which is included in Roman Catholic Bibles. Most other Christian denominations consider Tobit to be an apocryphal book. Gabriel announced the birth of John the Baptist to Elizabeth’s husband, Zacharias, who had thought his wife was barren. Later Gabriel announced the birth of Jesus to Mary, who was initially troubled. But Gabriel comforted her. He’s good at that. In chapter 12 of the Book of Revelation Michael leads the angels against the dragon, who is cast out of heaven, along with his followers. In the Book of Tobit, Raphael acts as friend and guide to Tobit’s son Tobiah on his journey to Media. Only after they have returned home does Raphael reveal to Tobiah and Tobit his real name and that he is an angel. Cause he’s a sly one. What are the different kinds of angels? What is the angel hierarchy? We’re comforting messengers of God. We can be a little mysterious. But we’re totally friendly. They’re kinda like my dads. These guys play a lot of pool. And they like cool jazz. If you are a leader and you pray to them, they can help you make good decisions. Just ask nice. They impose order and keep demons away. Good to have around. The virtues are miracle workers and the protectors of children. Be virtuous and maybe one of their miracles will affect your life. They try to keep us in order with all sorts of rules. We pretty much ignore them as much as we can, but they’re very nice. The thrones are the keepers of justice. They tend to be a bit serious. They have lots of thick books. Yes, these are the little chubby angel kids. They buzz around and act all cute and romantic a lot. I love the seraphim. They have four faces and six wings. And they give off a beautiful mesmerizing light. It’s as close to God as you can be. A lot of earthly artists try to paint this light. If you can capture the way the sun touches things, you will see the light of a seraph. You might find this list shown in a slightly different order. But it doesn’t really matter. It’s not like a ranking, really. We just have different sorts of duties. Which religions have angels or angelic beings? Christianity, Islam and Judaism all have angels mentioned in their holy books. Other religions have similar beings who occupy the space between the world of people and a supreme being. Cause you want us to. We like the way you depict us so we try to appear as close to your art and imaginings as we can. Hee hee. I’m small, but not that small. What did you do with Elvis Costello’s red shoes? I’m wearing them right now. Jessi can be found in the story, Dream Runner, available for the Kindle. And Gods and Angels, which you can read online.